Clematis need very little winter prep. Learning how to winterize clematis vines is fairly easy. Clematis are remarkably hardy and tolerant. With a few simple steps, your clematis will withstand the cold blows of winter and bloom another day. There are over 200 species of clematis, with these beautiful flowering vines found in most gardening zones. Clematis range in color from white to rich purples and burgundies, and are usually bred for large, showy flowers. Some have a strong scent while others have little scent. You can find clematis that bloom in spring, summer and even into the autumn. It's actually possible in some gardening zones to have four seasons of clematis blossoms! As perennials, clematis return year after year from the same plant stock. Most clematis varieties are pruned in the spring, and new flowers grow on the old wood. It's important, however, to check your own variety's growing and care guidelines, since pruning times can vary from variety to variety. The best source of clematis information is the American Clematis Society. If you're wondering how to winterize clematis vines, you'll be glad to learn that very little preparation is actually needed to help them survive the winter months. These hardy vines tend to take care of themselves. But some basic preparations do help. Deadheading means snipping off the spent flower blossoms. Take a clean, sharp pair of garden shears and simply snip off the flower blossoms. Be sure to rake them up. It's a good idea to clean up the area directly around your clematis vines to ensure that no plant disease lurk in the debris. Rake the area or pick up branches and large material by hand. While not imperative that you do it in the fall to winterize clematis vines, once the leaves fall off and the bare vine can be easily seen on the trellis, you might want to take some garden twine and tie branches to the trellis if they aren't following the pattern that you want. Be sure to use a garden twine and never use metal twist ties or twist ties made of plastic and metal. The metal portion can heat up in the sunshine and burn plants. Clematis like having a good, rich organic mulch around their base. Fall is an excellent time to apply compost and mulch. Use a rich organic compost, and then add an inch or two of mulch on top. Wood chips and hay make a good mulch. Place the chips around the crown or central portion of the plant where the main stem rises from the ground. If the plant gets zapped by the cold weather, this is the area that will be most affected and it's the area that needs the most protection. Fall is a good time to start browsing for next year's acquisition to your clematis collection! Since local nurseries probably don't have clematis over the winter, find some good gardening magazines and catalogs and start daydreaming. Mark off the clematis that suits your fancy. 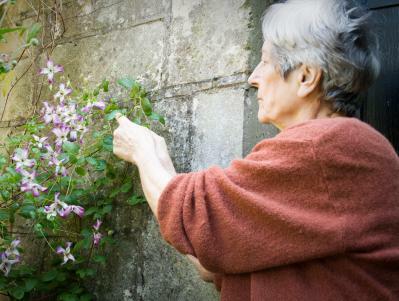 Winter is also a great time to explore ways of growing and showing off your clematis. A wrought iron obelisk is a great way to grow clematis as a focal point in the garden. During the winter, when most of the plants have died down to the ground and the trees have lost their leaves, you can really see the 'bones' or general outline of the garden. Photograph your garden during the winter, then make a photocopy and sketch onto the copy an obelisk or other garden feature to see if it fits in. If it does, consider clematis. With their gorgeous blossoms and hardy nature, they're a fine addition to any garden.